A group of Sri Lankan gypsies, members of a small and vulnerable community, has been spotted near some less crowded railway stations recently. We followed their trail in search of their origins and social hardships. The gypsies struggle hard to retain their identity without getting absorbed into the majority. They have always been a group apart even though they have adopted to the general culture of the country. We noticed them temporarily sheltered near Yagoda and Bulugahagoda stations. 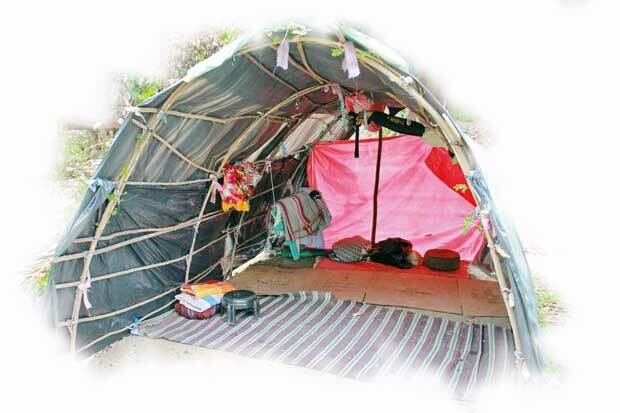 Their huts were made using Gliricidia trunks and covered with rough black polythene; they looked like black igloo huts. Cardboard and artificial mats were used as flooring while in some huts the raw earth was visible. They had very few utensils. At the innermost corner of each hut, there was a covered area probably with their clothes and valuables. This hut is called “Na Illa” which means the house of the snake. 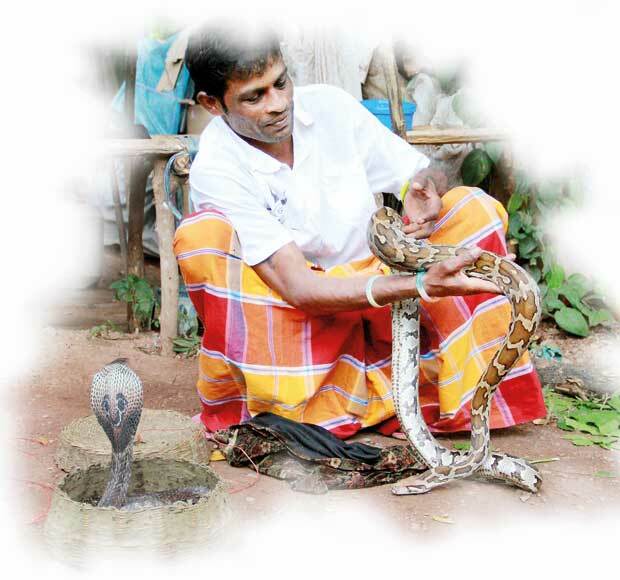 Their name is also connected with the snake, as the Sinhalese term for them “Ahikuntika” means snake dancer. (“Ahi” - snake and “Kuntika” – dancing). The women may be mistaken for Tamils. They wear saris, chew betel and travel to adjacent villages soothsaying and collecting clothes, provisions and money. Gypsy males wear sarong and pass for estate workers. They entertain people with monkeys and snakes for shows at markets and crowded places. Gypsies are believed to have originated from Andhra Pradesh in ancient India; some groups may have migrated to other parts of the world and to Europe, adopting to the cultures. In Spain, Portugal, Germany and other European countries, the gypsy community has become a unique sub group with a different identity. They are famous for music and attractive dances like the flamenco. Constantly travelling in wagons, some of them are supposed to have connections with the underworld and some are deemed to be anti social. 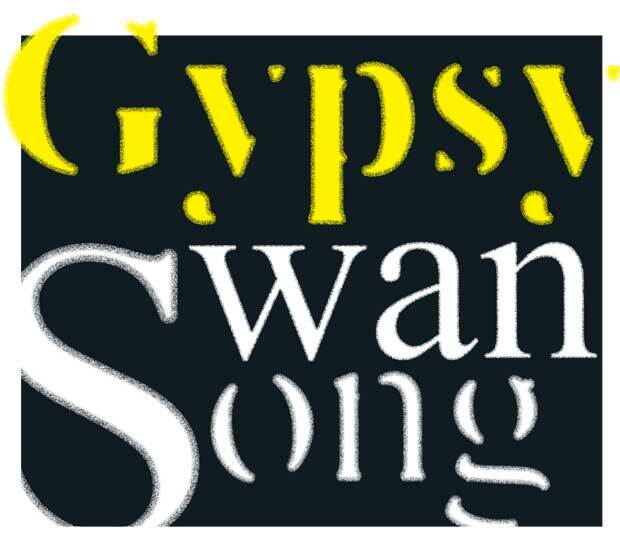 But with their lively music and dancing, gypsies have contributed and influenced Western literature, music and cinema. "The women may be mistaken for Tamils. They wear saris, chew betel and travel to adjacent villages sooth saying and collecting clothes, provisions and money. Gypsy males wear sarong and they may pass for estate workers. They entertain people with monkeys and snakes for shows at markets and crowded places"
Meanwhile in Sri Lanka, the gypsy community has quite a different socio-cultural portfolio vis-a-vis their western counterparts. They have been profoundly adapted to the majority society apart from their itinerant routine and their traditional ways of livelihood. Their crisis is similar to what is faced by the Adivasi (Veddah) community. According to the gypsies we met, their heritage has become an extra means of living to them which they are readily marketing. All these communities with markedly different cultures such as the Adivasis, Kaffirs and these gypsies have understood their market value and they even asked money from us for interviewing them. Wherever the gypsy community is, they have adapted to the environment, people, mode of transport and basic living conditions. Sri Lankan gypsies are seen in the North Central, North Western, Eastern and Sabaragamuwa Provinces. Some gypsy families were settled near Kala Wewa Bank by the Mahaweli Development Project in 1976 and later, a few more families were settled close to the Rajanganaya Reservoir. Yet another group of 25 families were given Sri Lankan identity and they were settled near Kudagama in Anuradhapura with land and paddy cultivations of 2.5 acres. There are people of Sinhala nationality as well as Telugu speakers and their religion is either Buddhism or Christianity. All the families have separate houses for each and the houses are facilitated with modern technology. Daasilage Raja from Kudagama, Thulana, commented about their hardships, challenges and fears. “I’m taking a monkey, snake and a python to shows and I go all around the country, especially to Colombo, to entertain foreigners. Speaking about the threats to their wandering life, Raja says that the gypsies that live in Puttalam who are being called “Ranna” are ruining their honour by performing immoral acts. “Even though our origin is the same, Ranna people are quite different from us. They have professions such as sharpening knives but do a lot of stealing. Some of them are living in rented houses in Ja Ela as we heard and their little ones are used as pick pockets and for stealing. Anyway, we are the ones who get caught for their misdeeds. “We earn about Rs.500 to 600 on a weekday, and 2000 during weekends. Our business has fewer customers now and therefore it’s immensely difficult to earn with our traditional professions. That’s one of the reasons why our people turn to foreigners and travel to cities like Colombo. “ I am 41 years. My mother is Engatakka, and I have six siblings. I’m married and have twins. My daughter does O/L examination this year, she is gifted at her studies and she is a member of school Kabaddi team too. I’m spending my earnings for my kids. I was schooled only till grade 5, and at that time our parents used to be alcoholics. "I’m taking a monkey, snake and a python to shows and I go all around the country, especially to Colombo, to entertain foreigners"
The gypsies are known by many different names around the world. These are just a few. Snake shows are characteristic of the gypsies and the snake is a symbol of their community. The connection between snakes and the “Ahikuntika” peoples is that sometimes it assumes a spirituality and forms of worship. Ahikuntika people have been traditionally known to earn day-to- day existence and had no practice of saving for the future. But their economy has changed as they have now largely adopted to the socio-economic culture of other communities. From what they said, it became evident that they were saving money for their needs by now. The younger generation of gypsies tend to work their traditional professions in secret or go looking for manual labour jobs in urban areas. Some can be found doing jobs related to tourism in Mount Lavinia, Dehiwala, Galle, Matara and Hikkaduwa areas. They give up education at a very young age in a bid to earn money. 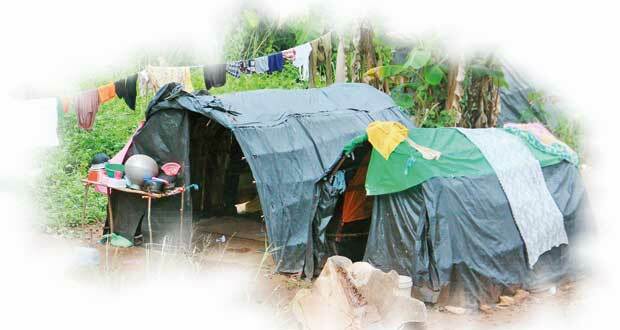 Even some of the Sinhalese people in these areas are extremely poor. Even the younger ones are characteristically very patient and this quality has enabled them to be good sportsmen. Gypsy parents keep their children at home while travelling to work, but they go away together for tours in the school holiday season. Most of them don’t have voting rights. Even though Gypsy people have an endemic culture, they have adapted to the majority community and its culture to a point where little of their own unique culture remains. Now their population is bigger and they find it difficult to travel due to scarcity of barren lands to settle in. This unique community has undergone urbanization and modernization at a rapid pace.